Born on September 28, 1926 in South Berwick, ME, she was the daughter of the late Albert and Fedora (LaBrie) McGee. She owned and operated the Friendly Variety Store in Willimantic for many years with her husband. 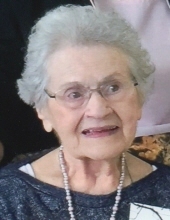 She was also a former member of St Margaret Church in Scotland and the Windham Senior Center. She is survived by her sisters, Georgette Cote of Manchester, and Priscilla Mulkey of Lakeland, FL; a brother, Richard McGee of Miami, FL; stepsons, Scott Bacon(Mary) of Mansfield, and their 2 daughters, and Mitchell Bacon (Audrey) of California and their 2 sons, and many nieces and nephews. To send flowers or a remembrance gift to the family of Theresa J. Bacon, please visit our Tribute Store. "Email Address" would like to share the life celebration of Theresa J. Bacon. Click on the "link" to go to share a favorite memory or leave a condolence message for the family.